From Middle English cokel, cokkel, kokkel, cocle, of uncertain origin. Perhaps a diminutive of Middle English cokke, cok (“cockle”), from Old English cocc (found in sǣcocc (“cockle”)) +‎ -le; or perhaps from Old French coquille, from Vulgar Latin *cocchilia, form of Latin conchylia, from Ancient Greek κογχύλιον (konkhúlion), diminutive of κογχύλη (konkhúlē, “mussel”), from Proto-Indo-European *konkho. 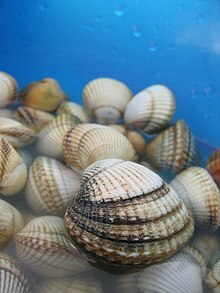 Any of various edible European bivalve mollusks, of the family Cardiidae, having heart-shaped shells. The shell of such a mollusk. (in the plural) One’s innermost feelings (only in the expression “the cockles of one’s heart”). (mining, Britain, Cornwall) The mineral black tourmaline or schorl. (Britain) The fire chamber of a furnace. (Britain) A kiln for drying hops; an oast. (Britain) The dome of a heating furnace. Lithuanian: (please verify) širdutės ? To cause to contract into wrinkles or ridges, as some kinds of cloth after a wetting; to pucker. Wikispecies From Middle English cockil, cokil, cokylle, from Old English coccel (“darnel”), of unknown origin, perhaps from a diminutive of Latin coccus (“berry”). Any of several field weeds, such as the corncockle, Agrostemma githago, and Lolium temulentum. But cockle, spurge, according to their law / Might propagate their kind, with none to awe, / You'd think; a burr had been a treasure trove.